Offering extreme flexibility and power, our medium-duty tow trucks provide better mobility compared to heavy duty tow trucks and higher strength compared to light-duty tow trucks. This allows us to handle most winch-outs, standard tows or accidents involving a commercial grade or small fleet vehicle. As of 2018, we own and operate the city of LA’s only 75-ton rotator, along with a robust fleet of Peterbilt tow trucks. So no job is too big for our team of highly-trained and certified towing professionals. 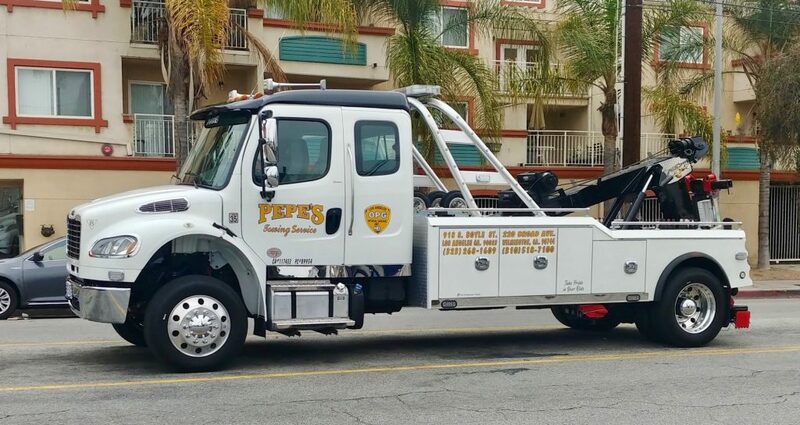 If you’re ever in need of a trustworthy, reliable towing service for your heavy-duty vehicles in Los Angeles, Pepe’s Towing is the company to call. Your business is our priority. We’re always available and on-duty 24 hours a day, 7 days a week. Call us at 323-268-1609.